We saw several great projects in Auroville and environs. One is called Prakti - a project to create fuel efficient stoves. Most people in India still cook on wood stoves and they both use too much wood and create a lot of smoke - which is toxic to inhale on a daily basis. Prakti has created a stove that optimizes the heat value of the wood and smokes very little. It is a great project and the stoves are already in use in many places in Tamil Nadu. Here are some pictures from our visit to Prakti's R+D facility. My friend Amos observing Prakti prototypes being heated up. Here is the chief engineer with their large kitchen model. These are in use at Sadhana Forest. There are many permaculture projects in Auroville. One of them was at Evergreen where we stayed. It is very interesting to know that fifty years ago when Auroville was established, the land was almost completely desert. Naime, Omid and Lili at the Evergreen nursery. Near Citadines we met a fellow called Domenico. He was a PhD student from Italy, and he had developed a self watering system of planters made out of pop bottles cut in half. Lili showing how the lid is perforated - this gets set into the bottom half of the bottle which has water in it. Half the plants are in open soil for comparison in the previous image. Sadhana Forest main hut. Lili and Shalev are having fun with the ropes. Sadhana Forest is a reforestation project in Auroville about 25 minutes from the main Auroville settlement. It is a great place for anyone to go and volunteer for 2 weeks - or 2 years! At the time of our visit they had about 70 volunteers, even one from Finland. Ooh the pollution in India. You may think that I will now write about air quality and dirt and garbage (which really really need to be written about), but I will leave that to others. I will write about noise. Holy smokes it is noisy here. IT'S NOISY!! First comes traffic. We have all seen images of traffic in India flowing from exotically disorganized to fully chaotic manner - when it moves. Back home we are conditioned to use the horn when there is danger. Well, here you use the horn to indicate that you are here. It is an existential tool. So everyone honks! Bikes, rickshaws, cars, trucks, buses - they ALL honk when anything that moves is nearby. And that is pretty much all the time. Bizarrely, some trucks even paint 'Sound Horn' on their backs - as if anyone really needed any encouragement to do so. The second issue is the amplified music. I will just call it Hindu muzak. In Auroville it starts at about 05:00 hrs am. And it is LOUD. Again, this must be some exhilarating exercise for the lone DJ in the middle of a field somewhere with speakers on top of a huge pole. The sound carries for miles. Miles. I am being told the music actually is from a temple but this makes no sense to me as it clearly is what I would call 'party music'. The religious calls for prayer or scripture readings are a different thing. Absolutely. They only start at about 05:05 hrs am, and blend with the aforementioned muzak. This of course is Hindu-Muslim unity in one sense so we are grateful for that. Another powerful factor are the dogs. Did I mention that there are tons of dogs here? Like hundreds. The Auroville animal shelter is full of dogs - all seventy five spots filled, all the time. The 'kept' dogs are generally watchdogs so they bark at anything that moves, especially all night long. And when one starts to bark the others join in with a big howl. If you can remember the scene from 101 Dalmatians where all the stray dogs are barking in a chain across the county to warn all existence that Cruella de Vil is on the loose, you will know what I mean. Indian dogs are good, solid howlers. It's of course Ok to have all this life around us. It's great. Why it can be an issue is that people here do not have windows - they have holes in the wall (if there are walls at all). Sometimes with mosquito netting. And we don't even have walls as you will know if you have read my posts about the treehouse 'capsule' where we are staying. So what to do? Well, you just go to sleep early, because you *will* wake up at five. WHAAAT - JÄRVEN TARINA IN INDIA?? Here is something I truly did not expect - watching a Finnish movie in Auroville. 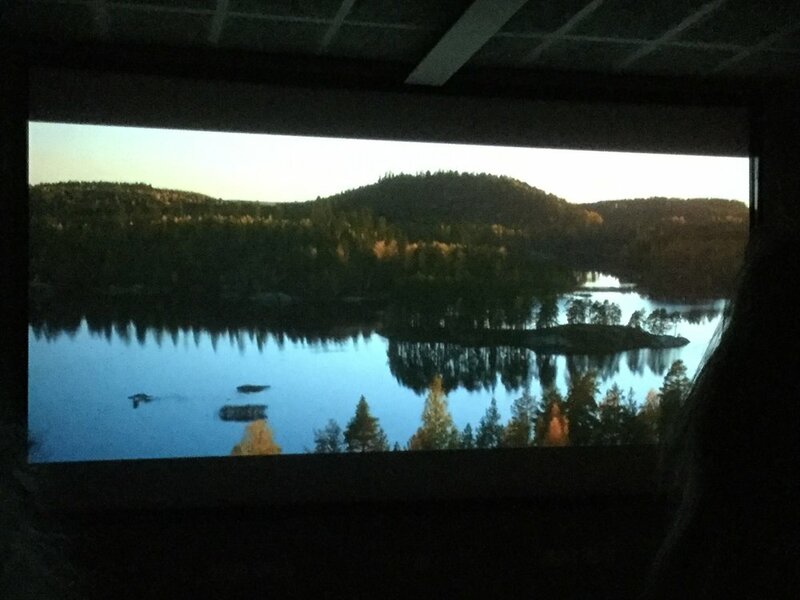 But this is what happened, as Järven Tarina (The Tale of a Lake) was screened at the nightly film screenings at 'Cinema Paradiso' club at the multimedia centre. We all piled in to see it, and as it had narration in English even the kids were able to follow the wonderful stories about forest spirits and animal life in and around Finland's thousands and thousands of lakes. Yay we made pasta from scratch yesterday. Both ravioli and tagliatelle! Dante and our neighbour Amos went on a quest for durum semolina and came back with the local version (sorry I do not remember what it is called will come back to edit later). The whole afternoon was spent in this happy gourmet craft and of course we capped it off with a big dinner with home made tomato sauce, aglio et olio, and Auroville parmiggiano. It was delicious - but the pasta ended up a little unsupple - so we will likely do it again!! The happy pasta chefs Amos and Dante. We mixed two kinds of flour. Production in action. Cut pasta is drying in the back on a piece of bamboo. The children got to help with filling the ravioli - spinach, onion and feta mix prepared by Tamar. Marilena is a visitor from Greece, and was helping Lili. One of the many lovely public buildings in Auroville is called the Unity Pavilion. We have been there for talks, meditation and just hanging out, but at Christmas they put on a great big celebration for children. Needless to say that we were there with bells on! At first there was craft - lots of shiny paper to cut stars and snowflakes from. The green square is Lili's. Then there was a huge spread of holiday food, hot chocolate and sandwiches. And ooh aah, there was Rice Pudding! All the children good fruit and goodies on the way out. Ok by request I am posting more images of the Matrimandir. I went to the very nice library here in Auroville and took photos of some books for you. This will help you appreciate this completely amazing structure more - photography is not allowed in the Park of Unity and when you enter the park you can only take yourself, all bags and purses are checked on the gate. And I am so glad it is so. View of Matrimandir across the amphitheater. This is an overall diagram of the Park of Unity. It is a silent park. It took years to build the Matrimandir. It was started in around 1971 and the dome was completed in 2008. The gardens are still under construction. It is not easy for me to communicate how special this building is, and how astounding its quality is. Aurovilleans built it, and none of them were builders to begin with. Excavation was done by hand, with over 400 Tamil workers hired to haul soil out in round baskets. This shows the entry to the main chamber and the Lotus Pond underneath it. And little by little, the community grew and every now and then a tradesman was amongst them. For example an Aurovillean from Siberia was a specialist in marble and natural stone. The gold discs (yes it is real gold) were made over and again through trial and error, until a sandwiching system was developed in Germany where gold leaf was fired in between two pieces of glass into mosaics. There are almost 1500 discs but the gold is so thin that it took 'only' about 14 kg of pure gold to coat the entire dome. This is a cross section of the dome. And yes Matrimandir means 'the Mother's Shrine'. This is inside the dome. The amazing white ramps lead up to the inner chamber. On the path upwards - the quality of finishes is superb. This is from inside a 'petal' - one of the 12 meditation rooms surrounding the main dome. Here is another petal. The quality of light is sooo subtle. 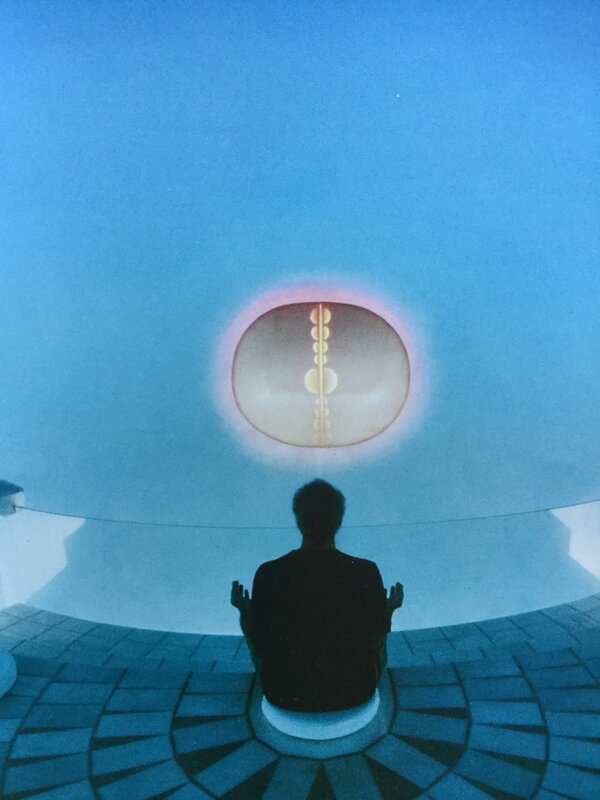 And this is the Inner Chamber: a round room with a brilliant ray of sunlight directed into a glass prism (and through it to the Lotus Pond below). The entire room is white, you come in wearing white socks and can stay for 15-30 minutes for quiet concentration. You can only sit quietly, any religious or codified movements or rites are not allowed. Access to the Inner Chamber is very restricted. Matrimandir is not a tourist destination. First time visitors need to come to Auroville the day before their intended visit and get a pass. Then on the day of the visit, one has to watch an introductory film and then go in with a guide. There is a long introduction with a guide in the Park before entering the building. The Inner Chamber can accommodate about 75 people maximum, and first time visitors stay in about 15 minutes. Children under 10 are not admitted to the Park. That being said Tuesday is Children's Day for Aurovilleans when they can visit with appropriate supervision. Before this trip I did not know if Lili would get to go at all, and I decided that the right thing will happen about that. And what happened was this: we enrolled her in a Young Aurovilleans Program intended for children of guests - and not only did she get to go, she went with her group leader and one other child. So the three of them got to experience that stunning space all alone for twenty minutes. The 'right thing' here was more like a VIP experience. That's how things often work out here, I am told.